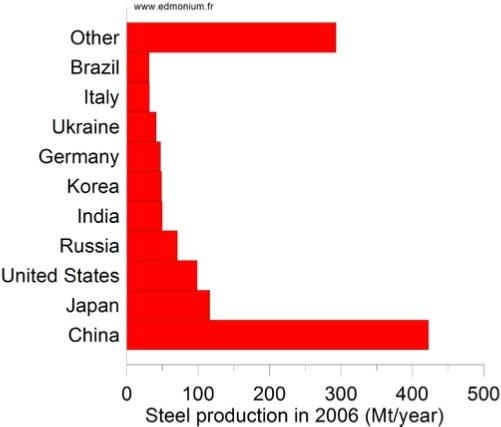 The world steel production was 1,344 Mt in 2007 and 489 Mt (36%) of this amount has been produced in China. The largest world steel producer is Arcelor Mittal with 8.7% of the production. In modern blast furnaces about 300 kg of coke are needed to produce one ton of metal. The iron and steel sector has consumed 24 EJ of energy in 2006 for a production of 1,250 Mt. Between 2000 and 2007 the production has increased by 58% while it stayed constant between 1975 and 2000. This sector is the first industrial emitter of CO2. The scrap electric arc furnace method needs between 4 and 6 GJ to produce 1 ton of iron. The blast furnace or blast oxygen method using mainly iron ore needs between 13 and 14 GJ per ton). Scrap supply is of course limited. 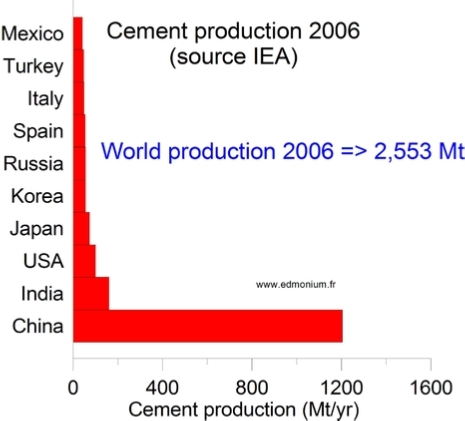 The amount of energy necessary to produce cement was 9.6 EJ in 2006. The corresponding quantity of CO2 emitted, associated to this production, was 1.9 Gt. China is the first producer of cement with 47% of the world production. The second one, India, account for only 6%. A large amount of energy is needed to produce cement: between 2.9 and 4.7 Gt/t (including electricity). The thermal energy needed to produce 1 ton of clinker (Clinker is a constituent of cement, resulting from the cooking at about 1450°C of a mixture of about 75% limestone and 25% silica) varies between 2.9 GJ/t and 4.7 GJ/t. In 20 years, China has reduced the energy consumption needed to produce 1 ton of cement by about 25%. The top ten producers are shown in the figure. They produce 72% of the world production of cement which is equal to 2553 Mt/y. 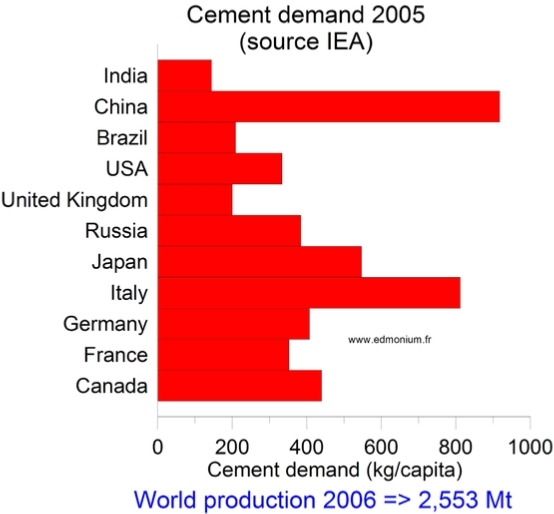 France has produced, in 2006, about 22 Mt of cement.